If you have ever wanted to run a job dependent on a certain performance condition, then this article is for you. 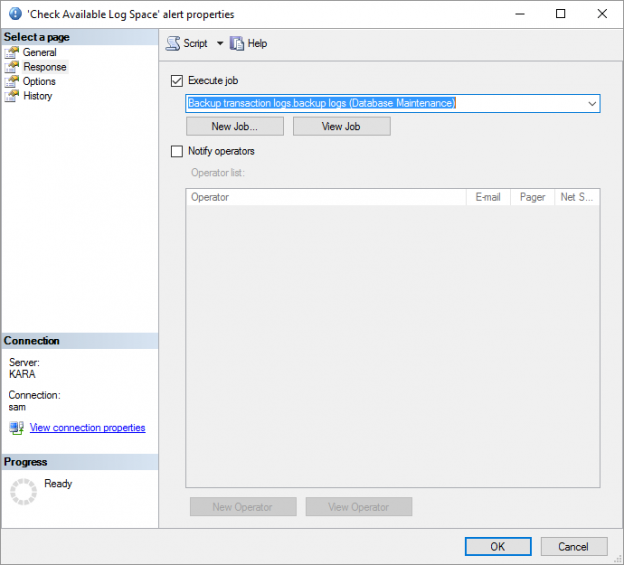 Usually SQL Server agent jobs are configured to run on a schedule. But what if instead of a schedule you want a job to be executed when a certain performance threshold is exceeded? SQL Server Agent Alerts are what you need. You are probably asking why you need to configure alerts when you want a job to be executed? After all you want this to happen without human intervention. The truth is that SQL Server Agent Alerts can do more than just send alerts. In fact, it has the option to either send an alert or to execute an existing job or both. This fires an alert when a specific SQL Server even occurs, such as when a specific error number occurs, or a specific severity level. This fires an alert when a performance counter reaches the specified threshold, such as if the average wait time for the Network IO wait statistic exceeds a certain value. This fires an event in response to a Windows Management Instrumentation (WMI) event, such as when a new file appears in a specific folder. In order to create an alert, you have to be a member of the sysadmin group, since the procedure sp_add_alert can only be executed by a member of sysadmin. This functionality can be accessed by going to SQL Server Agent in SQL Server Management Studio, and right clicking on the on the Alerts node. This is where you configure the basic details of the Alert such as the name and alert type. This is where you configure what should happen in response to the event. Allows you to specify what should be included in the messages, and how long the delay between the responses should be. Displays the history of the alerts such as when the last one occurred, if there was a response , how many times it has occurred and allows you to reset the count. Creating a SQL Server event alert is useful in cases where you want to perform an action in response to a specific error or error severity. In example: Let’s say an error with a severity level of 23 occurs, indicating that there may be a hardware or software problem which may have left your database in an inconsistent state. You may want to run DBCC CHECKDB to determine the extent of the problem. In this case, we are using Severity and selecting severity level 23. Alternatively, you can specify an Error number or a specific word or phrase contained within the error message. Once the Alert details are configured we will configure what should happen when this event occurs. We do that by going to the Response page. These options are not mutually exclusive. You are able to execute a job and notify an operator if you wish to do so. In this case, we will execute a job to check the consistency of the database in question. This alert type will be used if you want to create an alert based on a specific performance condition. This could be something like if the Page Life Expectancy hits a certain value or if the Queue Length becomes too long. In this example, I will setup an alert which will fire when the transaction log used space rises above 90%, which will then execute a job which will attempt to back up the log. If you want to, you can always include some functionality to check that the log file got truncated after the backup and notify someone in case there is a specific reason as to why the log is not getting truncated. The details and complexity of the logic is up to you. The performance counter you are interested in, such as the Percentage log used. Specify the counter threshold, if it reaches a specific value. The WMI event type allows you to configure an alert if a specific event occurred in Windows. In this example, I will create an event which fires when a file is dropped into a specific folder. This is the WQL query for which the alert should be triggered. If a file appears in the C:\WMITest folder the event will be triggered. The WITHIN 5 indicates the polling interval, which is set to 5 seconds here. WQL queries can be a bit daunting if you are not used to using them. There is a nifty tool which ships with Windows which can help you to test your WQL queries. You can access it by going to Run and typing wbemtest. The SQL Server Agent alert framework allows for a lot of flexibility in terms of notification and reactive responses which can be extremely useful in cases where a known recurring issue requires a known action in response.